You might not be able to tell right away, but I'm making some improvements to the layout of my blog. For one thing, I had advertising enabled, and they appeared at the end of every post. There were times when I was reviewing posts, and I noticed ads that I did not like. When I looked at the revenue from these ads, it was close to nothing. Like most of you, I go to blogs to read, not to shop (unless you have books or things that interest me.) So I ditched the ads. Also, I had several links to things in the sidebar that were distracting. I know there's still a lot of stuff on there still, but over the coming days, I plan to take a hard look and see what adds to the reader's experience and what distracts. If you see something on this blog that bugs you, let me know, and I'll consider letting it go. I think it's a continuation of my decluttering initiative. I've made good progress here at home though we still haven't done the books, pictures, and knick-knacks. Those will be the most difficult. One of the things I have that's taking up space here are boxes of my first book. I got a great deal from the printer, and I over bought. If you'd like a copy of my first book Remembering Big and would be willing to pay for the envelope and shipping (around $3 to most places in the US), I'll give you an autographed copy. It was too dreary for pictures again today, so I'm down to seeds and stems when it comes to photos. 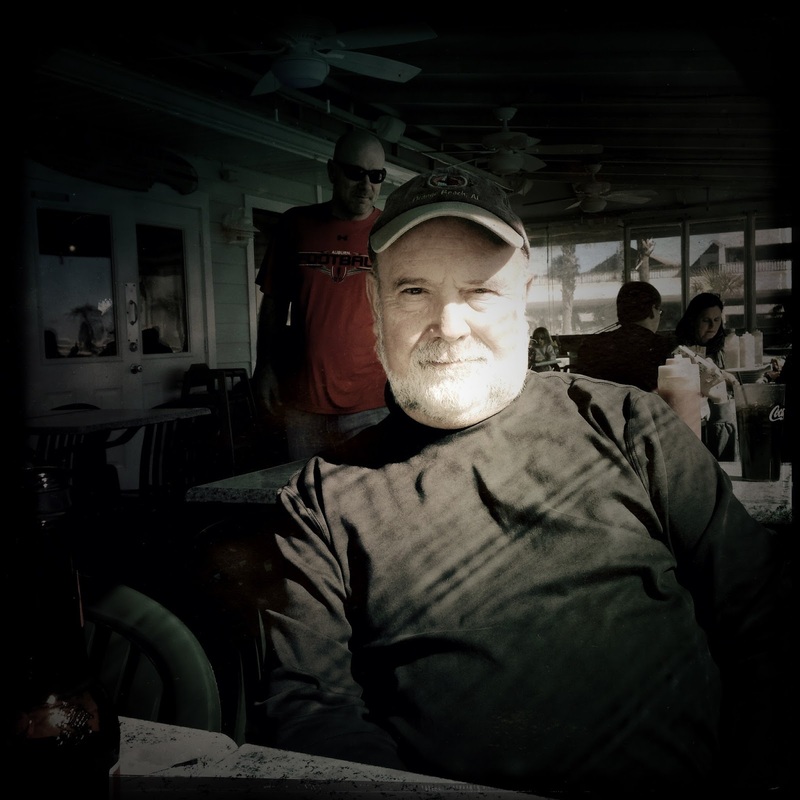 Jilda snapped this one of me last year at a small seafood place on the beach. In that photo you don't look like someone to tangle with. I think your blog looks great but I'm also thinking of making a few changes to my own blog to keep me interested. Take care. The first thing I thought of was your de-cluttering. You are really serious about this. I'm good at decluttering if I could have a week and a huge bin... if it was left up to me, I wouldn't have much left... maybe someday. I'll tell you what I like. Not exactly dealing with your question, but this seems the simplest approach for me. I don't click on ads on blog posts and I always wondered if they were worth it. Thanks for letting us know that they are not worth the bother. Our weather is crappy here today, rain, lightning, slippery yard, grey sky. I love the simple look of your blog. I hate going to blogs and pop up ads distract my reading. Takes the post pages longer to load as well. Yours is simple and easy on the eyes. Sure! Ill take an autographed book! where do I pay? Great photo! I love those small seafood shacks at the beach. This one looks like a place I know called Duffys. I've always liked the blog content, I guess I am not too observant, but you are right, I come to read not to shop. Looks like you are deep in though or maybe saying 'don't take the picture'. Sherry accuses me of that. I have ALL your books & I hate ads in blogs. I like the simplicity of yours!! Nice, clean layout. Distraction-free blogs are what I like and this is very good, good sir. Yes indeed, like you, I come to read a blog and maybe see some photos in the blog. No ads, for sure.